AliveIn5 Review - Stay Away! AliveIn5 is A Scam! AliveIn5 Review – Stay Away! AliveIn5 is A Scam! AliveIn5 found at alivein5.co seems impressive, but don’t be fooled, because AliveIn5 is a scam! We have done a detailed investigation and documented our findings in our AliveIn5 review, so do yourself a favor and read through it before committing yourself into a financial headache. The sales video of AliveIn5 is pretty much built on the premise of showing off a luxurious lifestyle, and to trap victims into thinking that all of it is possible just by using an automated trading software. Let us get this straight – there is no free lunch in this world, and there is no miracle trading software that will make you rich. If you want to make money online, you have to learn the skills, put in the effort and work for it. Brandon Graham, the alleged owner of AliveIn5 software, is shown in the video to go around setting up trading accounts for strangers. He uses his software and voila, there’s $1,000 in the trading account just after 5 minutes! Of course, he won’t tell you how it works, because it doesn’t. We’ll show conclusive proofs in the rest of this review, so let’s get straight into it. When I viewed the webpage of AliveIn5 scam, I was in Singapore. As you can see from the headline, it’s stated that this video is only available to citizens living in my country. 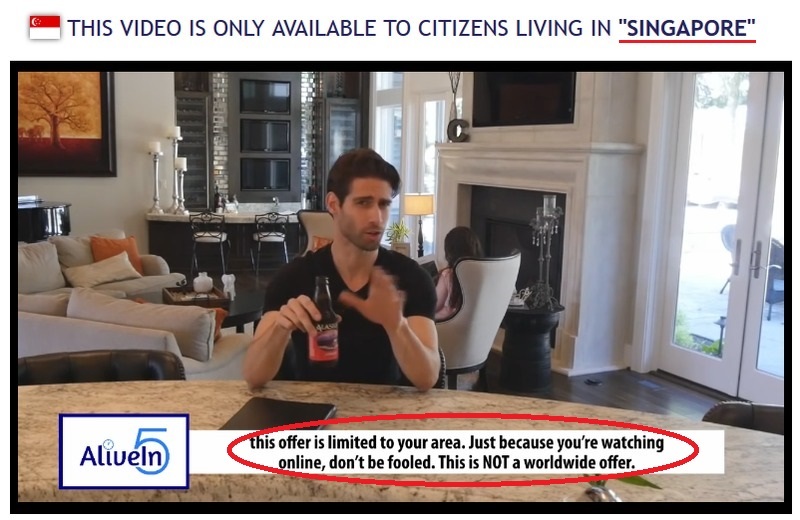 You may remember that at some point, Brandon claimed in the sales video that the offer is limited ONLY to your area (see image above). It is said that this offer is not available worldwide, and residents from all over the world won’t be able to access the miracle software, even if they wanted to. You were led to believe that you are extremely lucky, and you should take up the offer in a heartbeat. AliveIn5 scam is not just exclusive to your area as Graham claimed! I managed to “sneak into” United States and Germany using my VPN, and made AliveIn5 scam display the countries as if I’m viewing it from these locations. In fact, I was just sitting on my desk in Singapore. The truth is, AliveIn5 scam is using a geolocation script to determine the location of your IP address and displays it in the headline. 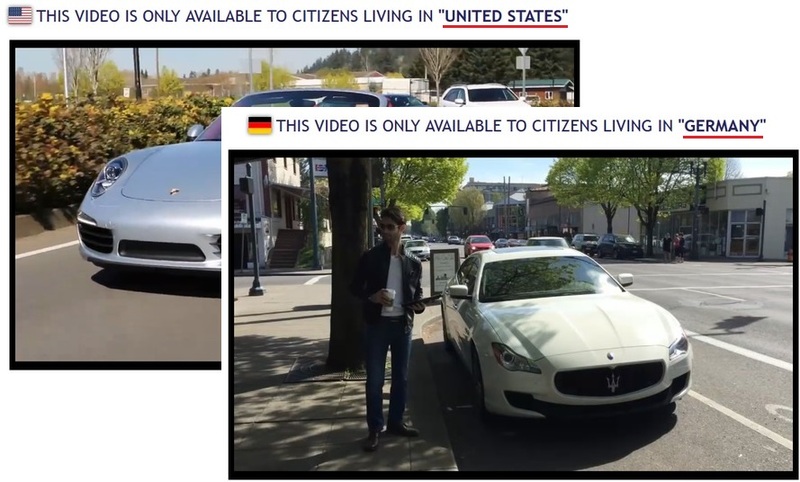 This trick, coupled with Brandon’s speech in the video, is used to deceive users into thinking that the software is only available to their area. In fact, the scam is marketed to victims from multiple countries. The “trading account” in AliveIn5 scam is just an image! Remember the scene from AliveIn5 sales video where Brandon Graham met Frank Turner, a homeless guy sleeping on a bench? He opened a trading account for him on the spot, and alleged made more than $1,000 for him within a mere 5 minutes. 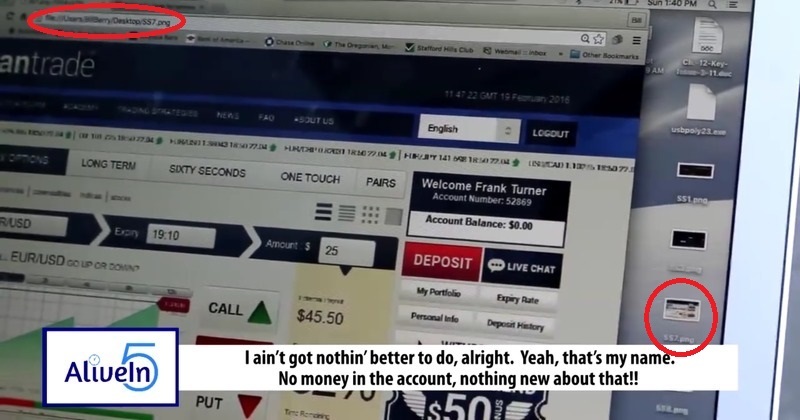 Brandon even showed the trading platform on screen, and verified with Frank Turner to make sure that it was his name on the account and started with no money. However, did you notice the subtle, yet critical mistake made by the scammers behind AliveIn5 scam? Notice the address bar in the browser. You can clearly see that it’s not a webpage, but instead an image file opened from the desktop. 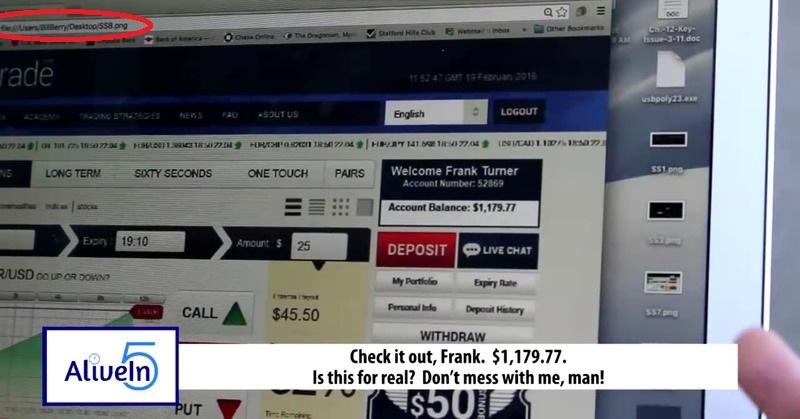 Now let’s look at the screenshot where Frank allegedly made $1,179.77 5 minutes after. Check it out, Frank. I photoshopped the image! Again, from the address bar in the browser, you can clearly see that it’s an image opened from the desktop. These are some subtle mistakes that 99% of the victims viewing the sales video won’t even pick up, but is so crucial to sniff out scams like AliveIn5. It goes without saying that Brandon Graham, his wife, Frank Turner, and people featured in the sales video are all actors and actresses hired to promote the scam. There are no car plates for Brandon Graham’s cars! Here is yet another glaring mistake we have spotted from AliveIn5 scam. You may have noticed that not only the car in Brandon’s garage has no car plate, but even the one he was driving had a blank car plate! Is it against the law to drive on the road with an unregistered car? Totally. So why was Brandon Graham, a multi-millionaire driving an unregistered luxury cars? The answer is simple – the car is simply rented from a car dealer. The same trick was used for Free Money Guaranteed scam, which we have reviewed earlier. Again, not every internet user who fall prey to the scam will spot this mistake, which is why we decided to write up our findings to warn potential victims. YES, ALIVEIN5 IS A SCAM. We strongly advise you to stay away from the scam if you don’t want to lose your hard-earned money. Insured Outcome Review – Insured Outcome is a Scam!